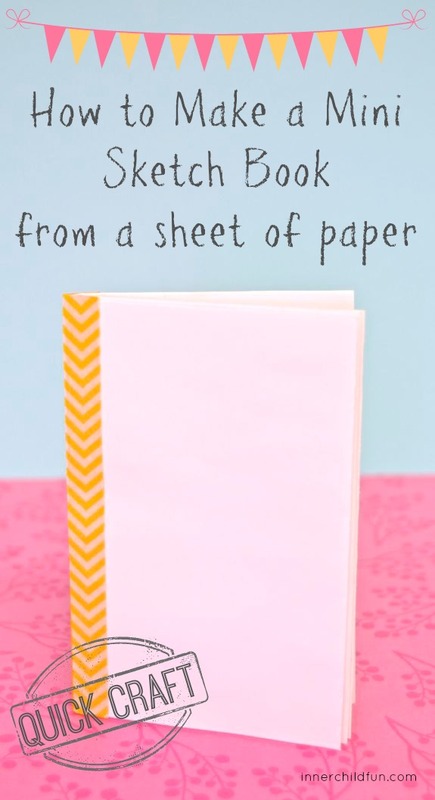 You won’t believe how easy it is to make these mini sketchbooks! These sketch books would be great for party favors, pocket journals, or just for doodling whenever inspiration strikes. They only take a few seconds to make, and my 9 year old made several of these as favors for her birthday party guests last year when she had just turned 8 at the time. I have to admit, they are a bit addicting to make, and even more fun to give as little gifts! That’s it! So simple, right? If you make these, I would love to know how you would use them. Leave a comment and share your ideas with us! So cute – these would be a great for the kids to make and use for Sundays to keep quiet:). I’m about to make these today for my daughter to stamp in! We’re having a cranky sick day & I think this will be a fun little surprise for her. Thanks for the amazing site! I am so happy to hear that, Alicia! I hope your daughter starts to feel better soon. <3 Thanks so much for stopping by! These would be great for nature scavenger hunts or to take on a field trip. They are also the perfect size to throw in your purse for wait times at appointments. Thanks for sharing all of your wonderful ideas! These are fantastic for keeping with you for when inspiration strikes; often when I’m out, I see a quote that I like, or a piece of art/craft that I would like to re-create… and taking pictures is great, but sometimes you just need notes! They’re also great for taking into appointments with you (as well as in the waiting room as suggested before) so that you can jot down anything important that’s mentioned… I know that I, for one, have a terrible memory sometimes! I’ve also got a friend who uses something very similar to this as a journal/diary type of thing. Each day, she has one little book with the date on the front; then she adds a page about anything important that happened that day (eg. Simon’s 32nd birthday party), the weather (with cute little hand drawn symbols like a sad rainy cloud) and a picture that she took of something that day. It’s like diary writing and scrap book combined. Then, one page acts as a food diary (she has allergies), one as a ‘Today I bought/spent’ and another as a diary entry/mood journal. Then, she hole punches them and ring binds them together by month, with little cardboard month covers. Cute as anything! Agreed! Great ideas, Brayden! These would be perfect! Love this idea. I’m going to use these for sketchbooks that the kids can make themselves and use in class. This method is so much easier than stapling sheets together and the double thickness of paper may keep things from soaking through to the next page if they use markers. I’ll let you know. Thanks for sharing! Can you just use ducttape?